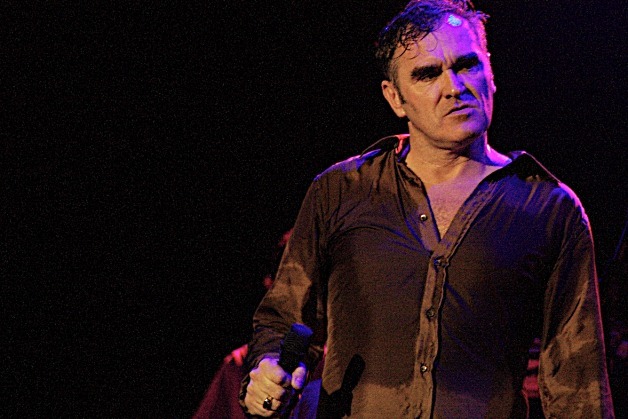 Morrissey at 2006 SXSW. ©2006 Charlie Llewellin. On October 10th, 2012, I watched Stephen Patrick Morrissey slog his way through a halfhearted set at Radio City Music Hall only to find himself at a loss when his apathetic audience failed to shower him with the kind of warm adoration he's become accustomed to. When you bask in the glow of the faithful, it's hard not to give them what they want. When their response is so tepid you have to ask them if "they are alive" and "if so, how do they know?," the give-and-take has started its swirling descent around the live show drain. Listen, I know Moz is older, wiser, and less apt to pogo around with wild abandon, but the strong-arm tactics of the intimidating line of security up front and the whining of the giant, diaper-wearing, man baby behind me who kept crying about us being "too loud" made the show difficult to enjoy. The number of people checking baseball scores on their iPhones was equal to those trying to kick start the excitement for the rest of us desperate to dance around and enjoy ourselves. This was supposed to be a rock concert, not a night at the ballet. You're probably wondering why any Smiths fan would expect more juice from a still spry Morrissey, but I promise you I've seen him fire on all cylinders and this wasn't one of those nights. He sounded good, the song choice was decent (Smiths favorite "Still Ill" was performed instead of "How Soon Is Now?" during the encore), and the venue seemed like the perfect touch of old world nostalgia. But he lost everyone's attention midway during the bloody drawn-out video montage behind the droning funeral dirge that was "Meat Is Murder," and had to work to get it back. Don't get me wrong, there were a handful of shining moments. Perhaps the most exciting development was the number of smart-looking button-down shirts (four!) he had to go through in between songs and his propensity for throwing them sweat-soaked into a thrilled front row. It's a safe bet that the older, more reserved king of mope that inhabits the dreams of Morrissey fans world wide bears little resemblance to the sullen outsider and wordsmith I remember from my youth, but I just wish he'd provided the spark that was needed to fully ignite an audience waiting to be engulfed in flames.